Because they are learning so much… and my memory is lousy. 8:30 AM Leisurely wake-up. I tell the kids that they have until 9:30 to do whatever (mostly YouTube) before we start in on our workbooks. They go off to grab breakfast and look up the latest Stampy Minecraft videos. I make tea, read my email, and chat with a friend online. 9:30 I gather the kids in the homeschool room, and am quickly talked into all of us doing workbooks upstairs on my bed. This quickly devolved into D7 complaining that she was being distracted and retreating to her room to work alone, E5 complaining that he was distracted so he came over to sit next to me, and R7 complaining that she was being distracted by everyone else complaining, so she stopped working altogether. Coming upstairs was a mistake; it is too casual a setting for them to concentrate in, and they lack good surfaces for writing on. They finally sort of hunker down around 10 AM, and I tell them they have an hour to Get Stuff Done (TM), which devolves even further into an utter battle of wills between both R7 and I and E5 and I. R7 eventually settled into a fun part of her workbook (writing a story), and E5 only started getting things done when I stepped aside from where we had our horns locked over his spelling book to the sequencing section of his core first grade book, which is easy for him, so safer territory in which to work. It was my mistake that we came upstairs, and my mistake to get into a battle of wills to begin with, so even though none of the kids got their ten pages done, we salvaged some work, and more good will, so I’ll take it. 11 AM Kids declared a snack/lunch break from their workbooks. I knew they wouldn’t go back to them, and they didn’t, but I was ok with that, since we had left on a good note. R7 went back to her computer with her snack, but D7 and E5 decided to be an ankylosaurus and compsognathus respectively, talking about how their different legs would allow them to reach, how they might eat, etc. I pulled out a dinosaur book we have that *used* to be above D7’s reading level, but which I thought would at least have good pictures for her now that she knew how to use an index to find them. I modeled using the index again, and found a nice image of compsognathus’ foot, which reminded me of a prosthetic running foot, so we watched a video of Oscar Pistorius running to see how the anatomy of the dinosaur’s foot might have allowed it to run so quickly. They wandered off again, on all fours, talking about what a family of velociraptors would teach to a baby compsognathus, so it could best survive with them. 1 PM, and someone was stupid on the internet, and with my info, no less, so I told the kids I needed to explode pixels to calm down, and we’d start in at 1:30 instead. They didn’t seem to mind. 1:30 PM We gathered in the kitchen to build a shaduf like the sort illustrated (badly) in Chapter 1 of Story of the World Vol 1, about how early nomads became the first farmers. I’d gathered together a crate to be our stand, a measuring tape, a three foot long piece of rattan, our pan balance and weights, and an old hot chocolate container to be our bucket. I modeled how to find the 1/5 of the way mark the wiki page on shaduf says the fulcrum should be placed at, and massed half a cup full of water, again, following the directions, seemingly handed down through the ages, off wikipedia. I reminded them how to tare and use the balance, and they were off. R7 soon realized that the rattan beam was far too heavy for the amount of weight we were trying to move (ie a small cup of water), so I went in search of other, narrow and lighter, shafts, and brownies, because engineering is hungry work. They played around with the new sticks, and cheered when they got it balanced, and saw how easy it was to move the water at that point. I was *hoping* that they’d extend their learning by looking at ratios of weight of water to weight needed to balance it at 1/5 of the length, and maybe even try out different fulcrum positions, but first R7 poured some of the water into her potato plant, Jesse, demonstrating how to use a shaduf to water a crop, thereby changing the volume of water left in the cup, and when we tried to mass a new cup full of water, people were getting careless about placing the weights, and water got spilled everywhere, so we grabbed our sponges (this is not a tidy project), cleaned up, and decided to take a break before we became frustrated. We decide to leave the apparatus out, though, since they wanted to show it off to Daddyman when he got home. 2:30 PM We took a brief break after the shaduf experiment, during which D7 started walking around the house with a different gait than I’m used to seeing. She said she had seen how compsognathus feet worked for running, but was trying to see what they’d be like for walking. She said her steps were shorter, but springier. 3:00 PM In the homeshool room, Writer’s Workshop folders out, R7 asked what I was going to challenge them with today. Yesterday I asked them to use an interesting adjective, and today I asked them to give a direction, either from one character to another, or from one character to the reader. They all set to, and each decided to do the challenge, which is not required. R7 asked the reader to pretend to tuck in Little Timmy (a recurring character in R7’s work for several years now, which is saying something), D7 and I had a conversation about what a reader could easily do to help her character, Lilack, feed her cat, Jack. She decided to ask the reader to make the sound of a can opener, and we all obliged by making ‘rrrr rrrr rrrr’ sounds for a few minutes, all smiles. E5 dictated part of his boy-and-his-dog story to me, asking the reader if he would help feed him, but he hasn’t gotten to HOW that help might be given as of yet. I write his words in yellow highlighter, then he copies over them in pencil, making them his own. He wrote very neatly, then drew a picture of the dog in the top half of his paper, where space has been left for just that purpose. While he and I worked, the girls conferenced with each other about their work. I turned to my blog, and started working up a post on the shaduf experiment, both because I wanted to, and also because modeling writing is part of the Writer’s Workshop method. I’m not sure that the kids grok that I’m writing when they see me on my computer thusly, though, so I might need to go back to paper writing, since energy started dissipating rather rapidly at that point, but that might be because I forgot both the timer (we usually write for 20-40 minutes, but often keep going after the timer) and, *much* more critically, the tea and hot chocolate – with marshmallows! – that has become a cherished part of the routine. The kids were appalled when I pointed out that we’d forgotten! I doubt that oversight will happen again. 4 PM We end the formal homeschooling part of our day, and veg for a while. The kids go off to play dinosaur hide and seek, and I take a business call before getting back to my email and a little online social time. 5 PM I start in on a massive pile of dishes; I carefully took pictures of the shaduf experiment only from the counters *down*. Designing good homeschooling projects is not necessarily compatible with good home keeping! Glad we’ve left our experiment out, since the kids are seemingly taking turns coming in and weighing random things; a stuffed dog, a pencil, etc, and then moving them around on the shaduf. 6 PM Daddyman arrives home bearing Valentine’s candy for us all, and excited to see the evidence of our work strewn all over the kitchen floor. We sit down to dinner, and more talk about dinosaurs, before I move into the homeschool room next door and fire up our Minecraft server to work on the next phase of my house construction. We play, or try to play (stupid firewalls and port forwarding and socket errors) until about 8 PM, when we shut up the downstairs of the house for the night. I’ve been writing this and chatting with a friend for the last hour, and the kids are watching videos and relaxing. I’ll rest on a hot pad soon (too many hours on the computer kill my back), and then read some pedagogy and plan our water science activity for tomorrow before we all go to bed around 10 PM. This entry was posted in daily round, hacks, language arts, STEM. Bookmark the permalink. Update to the Curriculum page! STEM Lego Minifigs! For girls! Hey, Stranger! Long time, no see! Fireworks of a different sort: Higgs Boson! Do Creationist curricula meet the National Standards? 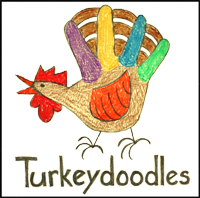 All writing and photos copyright of Siggi and the Turkeydoodles, unless otherwise noted. 2011. Feel free to link back here if you like the content, but please do not copy this content for your own use. Danke!